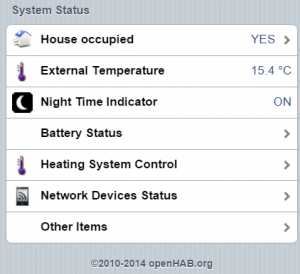 This entry was posted in Home Automation, Howto and tagged json, metoffice, openhab, transform. Bookmark the permalink. I very limited start on the shutter contact implementation but I haven’t gotten anywhere useful – I have lacked the time and I doubt I’ll have much in the near future. Do have a go if you are able to. I have shutter contacts available to me so I am happy to test and review your contribution to the project. Just a note of warning – it seems in general the pairing procedure can be a bit buggy – the devices don’t respond as I would have expected according to the analysis I have done. I have tried to work out why but I don’t have any more info.